We can’t wait to ‘share the plate’ with the world’s best barbecue. 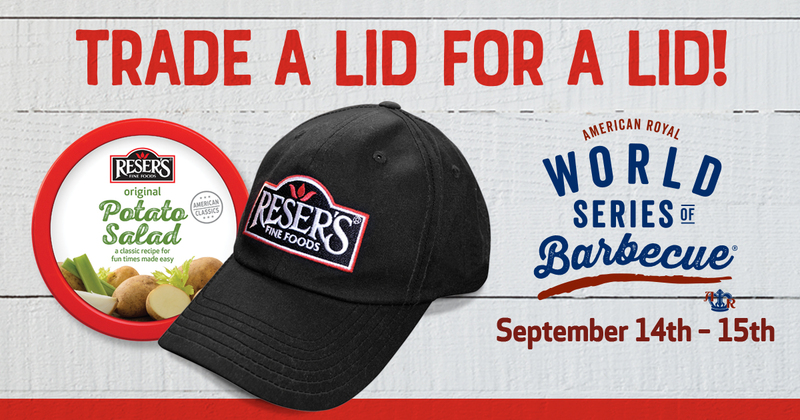 Reser’s is proud to announce it is the “Official Side Dish” partner of the American Royal World Series of Barbecue to be held September 13-16 in Kansas City. This 4-day event will draw 50,000 people and feature live music, local food, a car show and many kid-friendly activities. More than 500 competition barbecue teams will compete for prize money and top bragging rights in a variety of food categories. The Side Dish Contest features the following categories: beans, potato, vegetable, dessert and overall. In April, Reser’s celebrated the grand opening of a new state-of-the-art food processing facility in Topeka, adding 150 jobs to the local economy. “Reser’s has a strong heritage in the local Kansas community. And we can’t wait to ‘share the plate’ with the world’s best barbecue,” states Nathan Roe, senior brand manager. NASCAR Show Car Appearance: Snap a selfie in front of a real racing car! Salad from Price Chopper, Hen House, Sun Fresh, Mosers, Prengers, C&R, Ray’s Apple Market and other local Supermarkets carrying Reser’s salads. Step 2: Attendees can then bring the product’s iconic red lid to Reser’s booth and exchange it for a limited-edition hat. Reser’s deli salads are enjoyed nationwide, but there are some interesting regional taste preferences. In Kansas, consumers enjoy both traditional deli salads as well as newer flavors. Reser’s top-selling deli salads in the Kansas market are Deviled Egg Potato Salad, Deviled Egg Macaroni Salad, Cole Slaw, and Smokehouse BBQ Beans. Family owned and operated, Reser’s is the leading provider of fresh refrigerated deli salads, side dishes and prepared foods. For more than 65 years, Reser’s has been making fun times easy and affordable for every family. Reser’s famous deli salads and sides are family favorites at the race track, picnics, BBQs, Country Music Festivals and tailgates. Founded in 1950, the company remains committed to providing delicious refrigerated foods for the supermarket and food service industries. Reser’s operates 14 facilities in the United States and Mexico and employs more than 4,500 employees in the United States, Mexico and Canada. Visit http://www.resers.com. Stop by the booth to "Trade a Lid for a Lid"